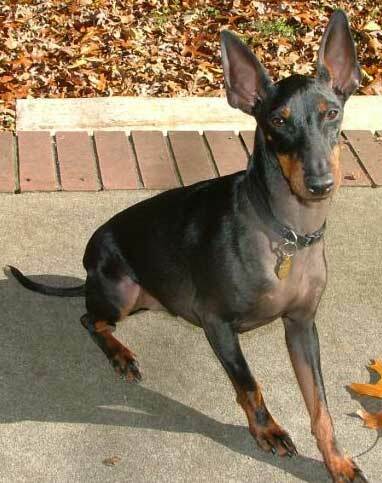 Learn about the temperament and personality of the Toy Manchester Terrier. Discover what he's like to live with, his traits and characteristics and how he generally behaves. And look at lots of Toy Manchester Terrier photos. The Toy Terrier is alert, energetic, brave, feisty, and extraordinarily loyal. They quickly form strong bonds with their owners. They are sharp-witted, observant, discerning, and make good watchdogs. While they are affectionate with their families, Manchester Terriers can be reserved with strangers. They are certainly willing to take action if it is necessary to protect themselves, their home, or their family. But that is rarely necessary, as they have a fairly impressive bark, which they are quick to employ. Manchesters are lively, athletic, playful, and can be hilarious. They are great companions for active and energetic people, and they are very adaptable. They love to join in with family activities and a Manchester will consider himself to be a member of your family. They do well with well-behaved, gentle children and with other dogs. However, if challenged, a Manchester will not back down, no matter the size of the other dog. They can also coexist peacefully with cats, especially if introduced at a young age. They do not, however, do well with small pets such as rodents and rabbits, because they will hunt them. These are intelligent dogs who are eager to learn. They can become quite obedient, and they can be a bit stubborn. They are responsive, intelligent, and incredibly devoted to their owners. Just know that they also like to help with the gardening. The Toy Manchester Terrier is intelligent and quite easy to train. He learns new commands quickly at an above average rate. The Toy Manchester Terrier sheds a fair amount of hair. You'll find hair stuck to your couch, carpets, clothes and everything else in your home. Upload a photo of your dog to appear on this page.